I made an important discovery yesterday, with the help of my new psychologist. Yes, I’ve started seeing a psychologist. I figured that since I’ve got a history of depression, and since I’ve recently begun a new unplanned adventure into the dark alleys and corners of anxiety, I should probably have a mental health professional in my corner, helping me navigate this adventure. Also, it’s kind of like putting on a lifejacket while the ocean is calm. I’m happy to talk about this, because one thing I know to be true, is that conversations about mental illness are still tragically under-represented and heavily stigmatised. To me, seeing a psychologist to help with my mental health is exactly the same as having a nutritionist helping with dietary behaviours, or a GP helping me recover from a severe physical ailment. So I share my own journey, in the hope that it helps someone else seek the help they need, without feeling any shame. Back to my discovery. I was discussing possible anxiety triggers with my psych, and one that came up was money – or rather the fear of money running out. I explained, in my very visual way, that in my head the image I saw was a tall, sheer cliff, and that when the money ran out, we would fall off the cliff, and end up in a mangled, fiery wreck at the bottom. We spoke further about the biological way that triggering actually occurs. The Amygdala is an almond-sized set of neurons sitting in the middle of the brain, which is responsible for our fear response – Fight/Flight/Freeze – and it can be triggered in as little as 50 milliseconds. 50 milliseconds! Once triggered, the body’s systems get flooded with adrenaline, cortisol, and a bunch of other chemicals designed to get us to fight off the sabre toothed tiger – real, or imagined. And, by the way, all rational, calm, reasoning sections of the brain effectively get shut down. Which helped explain my own experience of panic attacks. In the middle of one, my chest feels tight, my heart races, my breath becomes short, and no matter what I try, I can’t seem to get a deep breath into me to calm myself down. Further, I am able to at least recognise that there’s nothing real about the fears – i.e. they are all literally in my head – but this knowledge isn’t enough to calm me or help the panic attack subside. Rational brain = bye bye. Thanks, Amygdala. We work on that basis in The Root Cause. We give kids the knowledge to make better food choices, which in turn gives them the power to take responsibility for their own food choices, and hence their own health journey. So we returned to my visual of the cliff, impending doom, death from freefall, etc etc. Completely scary, not empowering at all, and not useful as far as visual images go. “What kind of visual do you think you could use instead, that might be more empowering?” asked my psychologist. Instantly my mind went to the ocean, and waves, and surfing. It’s a metaphor for so much in my life. Rough waters, calm waters, ebb and flow, waves coming and going, fluidity of movement, and an over-riding feeling of peace and calm and comfort. My new practice is to visualise our business money situation as a beautiful ocean, with waves, tides, and lots of flow. We’re working to make the tide come in (more money) but even so things will flow back and forth a bit while this occurs. The key here was that I had accepted and internalised a disempowering visual, and it was one of the key triggers of my anxiety symptoms. As a result of yesterday’s session, I am now choosing an EMPOWERING visual, which will bring me peace and calm, and help me remain resourceful and taking actions to move my business and life in the right direction. Have a think: what stories or visuals have you internalised that are disempowering? If it doesn’t serve you, perhaps you could choose a new visual or a new story? 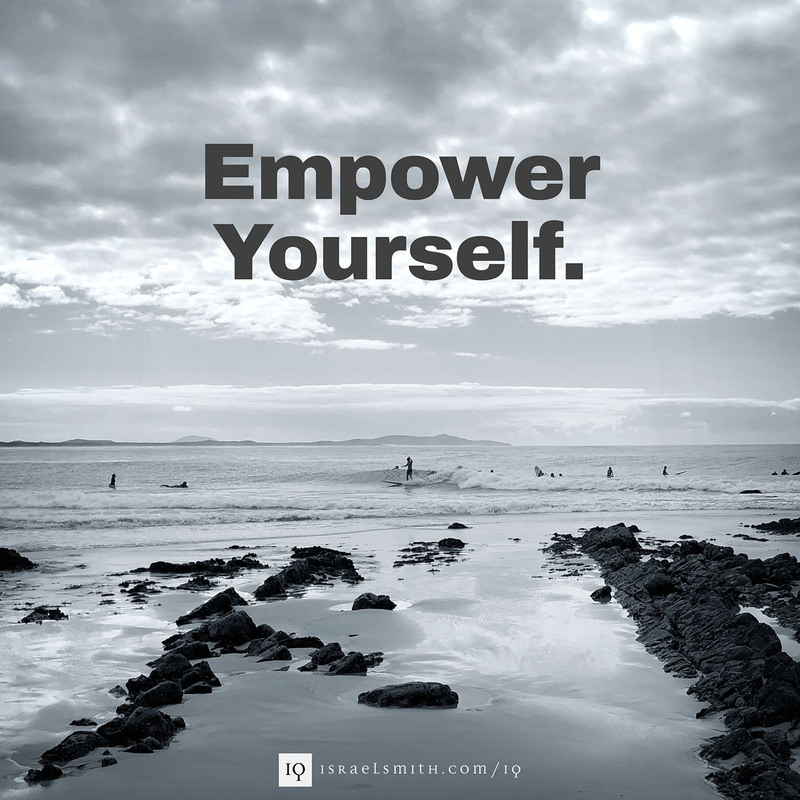 That’s what today’s IQ is all about: empower yourself. Take back your power. I’m off to visualise my beautiful ocean of cashflow, moving with fluid ease, and bringing me a rising tide of income.